Canadian oil sands have long been recognized as one of the world’s largest endowments of oil resources with over 170 billion barrels in place. The resource endowment places Canada second only to Saudi Arabia. Canada’s oil sands are located in Alberta, and unlike conventional crude oil, the oil sands come in the form of bitumen, a heavy, thick, and viscous substance that requires more intensive extraction techniques than traditional oil production. Oil sands are produced either from surface mining or in situ processes (see Figure 1). About 80 percent of the recoverable oil sands reserves can be extracted using in situ methods, which in contrast to surface mining, cause less damage to the local environment. 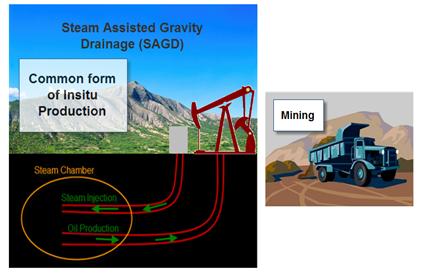 SAGD (Steam Assisted Gravity Drainage) is the most common form of in situ production and is energy intensive because it uses steam generated from natural gas to heat the bitumen so it can flow to the surface (see Figure 2 below). About 20 percent of the oil sands are recoverable through mining operations where oil sands are scooped from the surface and moved in trucks. Mining methods scar the landscape and have historically required long time periods to complete reclamation programs, particularly given that tailings ponds can take up to thirty years to fully settle. These two methods of production, mining and in situ, contribute higher volumes of greenhouse gas (GHG) emissions than the production of conventional crude oil because of the relatively high energy use and/or removal of the land surface. Oil companies engaged in oil sands production have been exploring alternative extraction processes to address Canadian regulatory constraints on GHG emissions. In situ production relies heavily upon natural gas to generate steam and as a result its GHG emissions are higher than surface mining. However, production through surface mining causes much more damage to the land and often draws more public concern and criticism than in situ production. Because of the public concern over surface mining, combined with growing advancement in in situ technology, production from in situ methods is likely to exceed output over surface mining in the future. In situ operations began less than ten years ago, but have reduced their steam usage by 15 percent since that time. Since bitumen is viscous oil, it must either be upgraded into a synthetic crude oil (SCO) or diluted with condensate (or another natural gas liquid) so it can flow down a pipe and be transported to a refinery. This latter option has the potential to meet the feedstock requirements of complex U.S. refineries because diluted bitumen (also called dilbit) from in situ production is similar to conventional heavy crude. Upgraded bitumen yields a synthetic crude oil that is similar to a light conventional crude. Last year all mined bitumen was upgraded into synthetic crude while just a fraction of in situ bitumen was upgraded. Figures 7 and 8 illustrate the typical outcome of oil sands bitumen according to its production method. Source: EPRINC and NEB information. Rising oil prices have made the once uneconomic oil sands production profitable and have allowed for increased investment and significant advances in technology. Estimates vary on the cost of production for a barrel of Canadian oil sands and this is understandable given the different forms in which a barrel is produced and whether or not the bitumen is upgraded. In 2005 the National Energy Board assessed the supply and operating costs for producing a barrel of Canadian oil sands. Figure 9 shows the estimated operating and supply costs by extraction method. Costs have been converted from Canadian 2005 dollars to US 2010 dollars. (Note that in 2005, the price for a barrel if oil was in the $40 range.) Supply costs here include operating costs as well as capital costs, taxes, royalties, and a return on investment. As the above table indicates, costs vary according to the production process. The production of oil sands is subject to more cost based risk than conventional oil production. Energy, material, and labor costs can bring about large swings in the cost of production. Extraction methods such as in situ which use SAGD, require a significant amount of natural gas – a rise in natural gas prices is a therefore a cost risk in the production process. Furthermore, while all bitumen produced from mining operations is upgraded, only a fraction of in situ produced bitumen is upgraded. The rest of the bitumen is blended, often with condensate, so it can be sent via pipeline. Blending costs can therefor impact the cost of production for some in situ produced bitumen. While production costs are subject to a number of inputs, improvements in extraction technologies have the capability to reduce costs in the future. Because of their high energy use and land disturbance, producing Canadian oil sands emits higher levels of GHGs than conventional crude production. Estimates of the contribution of GHG emissions from the production of oil sands when compared to the production of conventional crude oil vary considerably. The results of a DOE study (replicated in Figure 6 below) showed that upstream oil sands GHG emissions were roughly four times greater than the average emissions across all U.S. production. However, upstream production is responsible for only a small fraction (usually around20 percent) of GHG emissions on a well-to-wheel basis. Oil sands production emits between five and fifteen percent more GHGs than conventional crude on a well-to-wheels basis. In well-to-wheels estimates of GHG emissions, most emissions are associated with the combustion phase of fuel, the end use in the transportation sector. In September 2010 Cambridge Energy Research Associates (IHS CERA) released a report on GHG emissions and Canadian oil sands. CERA reported that GHG emissions for Canadian oil sands were on average six percent higher than the average crude processed at U.S. refineries. The reason for this relatively modest difference in GHG emissions is because oil sands are often diluted with low emission blend stocks. For example, U.S. oil sand imports are roughly 55 percent blended bitumen and 45 percent SCO. Because bitumen must be diluted with condensate (or other natural gas liquids) in order to be transported in the form of blended bitumen, just 70 percent of a bitumen blended barrel is from oil sands; this in turn lowers the GHG emissions compared to other bitumen. The following chart in Figure 6 below illustrates the upstream GHG emissions of various types of crude oil. Source: “An Evaluation of the Extraction, Transport and Refining of Imported Crude Oils and the Impact on Life Cycle Greenhouse Gas Emissions”, DOE/NETL-2009/1362, March 27, 2009. Canadian oil sands were weighted by type and on their U.S. export share. Canada’s global percentage of energy related emissions is two percent. Broken down by sector, Canada’s oil sands equate to five percent of Canada’s GHG emissions or 0.1 percent of global GHG emissions. The Provincial Government of Alberta began limiting GHG emissions for large industries in 2007 by instituting GHG reduction targets and a carbon tax. In doing so it was the first government authority in North America to regulate the GHG emissions of large industries. Since 1990, on average GHG reductions per barrel of oil have been 33 percent, with some making reductions as much as 45 percent.